This Homemade Hamburger Helper recipe lets you DIY this comfort food favorite at home. This simple dinner is made with pantry staples and is ready in under 30 minutes. Plus it tastes so much better from scratch! Recipe includes links to other easy dinner recipes made with ground beef. I’m a big fan of easy, one-skillet dinner recipes. This is the kind of easy dinner recipe that is great to have in your back pocket, especially for busy weeknights. The great thing about how simple this recipe is is that if you can make Hamburger Helper with the box, you can make it from scratch. 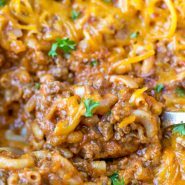 This easy dinner is just browning ground beef, stirring in a few other ingredients, and letting it all cook! In order to keep the pasta saucy, it’s important to keep it at a simmer. If you boil the pasta, you may end up with dry pasta. This recipe uses Greek yogurt (or sour cream) rather than milk. The yogurt adds just a bit of creaminess without thinning the sauce like milk would. More ground beef family dinner ideas! 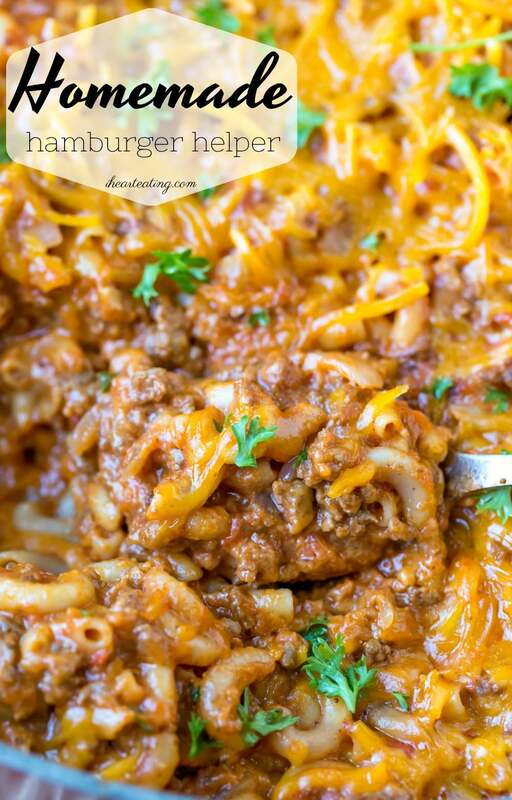 If you’ve tried this homemade hamburger helper recipe, don’t forget to rate the recipe and leave me a comment below. I love to hear from people who’ve made my recipes! You can SUBSCRIBE to receive my latest recipe newsletters or FOLLOW ME on FACEBOOK, INSTAGRAM and PINTEREST for even more delicious food. 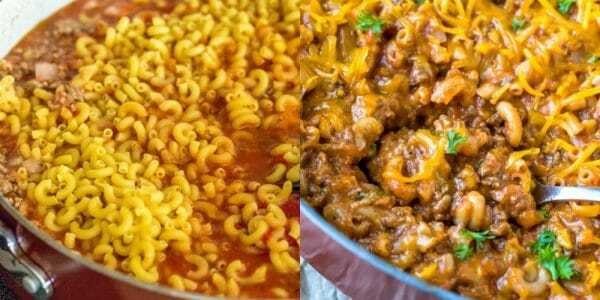 Easy recipe to make hamburger helper at home. Heat a Dutch oven or large deep skillet over medium-high heat. Add beef, and cook until browned. Drain ground beef, and return to skillet. Stir in onion, and, stirring regularly, cook until just softened, about 3 minutes. Add remaining ingredients EXCEPT cheese, and stir to combine. Bring to simmer, and reduce heat to medium-low. You want the mixture to simmer gently, not boil. Cook for about 10 minutes, or until most of the liquid is absorbed but mixture is still saucy. At this point, the pasta should be al dente. Sprinkle with additional cheese, if desired. *Substitutions: 2% or full-fat plain Greek yogurt, regular sour cream, and lite sour cream. **I sprinkled a little chopped fresh parsley over the pasta to brighten it up for the pictures. It isn't necessary for the finished dish. This was delicious! It really is better than the box, it was easy too. Thanks! Thank you! So glad you liked it. =) Thanks for commenting!